This topic was published by DevynCJohnson and viewed 1129 times since " July 28, 2015 @ 06:00UTC ". The last page revision was " March 25, 2016 @ 15:46EDT ". 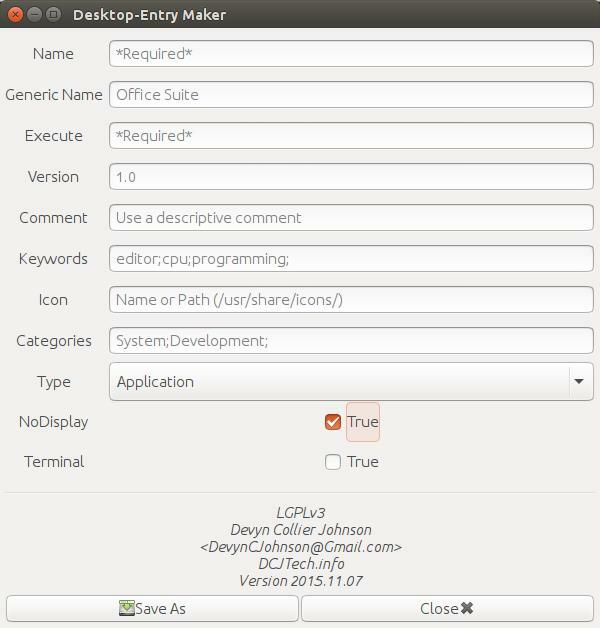 "Desktop Entry Maker" is a user-friendly GUI that creates desktop-entry files (as discussed at http://dcjtech.info/topic/desktop-entry-files-and-xdg-open/). Users must at least fill out the "Name" and "Exec" field and then choose where to save the file. The rest of the data is filled out automatically. The minimal requirements are Python3, GTK3, and PyGObject. "Desktop Entry Maker" is licensed under LGPLv3 and is made by Devyn Collier Johnson <DevynCJohnson@Gmail.com>. The XDG "*.desktop" file can be placed in /usr/share/applications/ or ~/.local/share/applications/, thus adding the program to the desktop environment's menus. However, the program must be placed in a directory listed in the system's path (i.e. $PATH). Please feel free to email me suggestions, bug reports, concerns, etc. Also, please consider donating to DCJTech for further development.